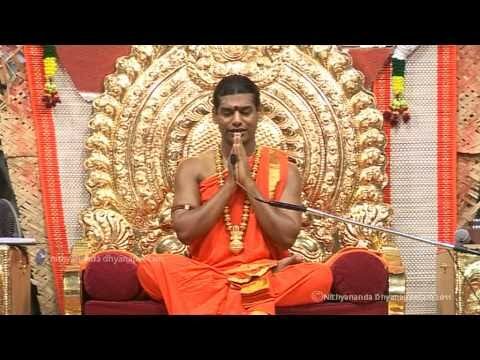 PARAMAHAMSA SRI NITHYANANDA on Mountains become mustard seeds! WE CRINGE when questions come our way. We try to avoid searching questions that cause us to look within. Only questions that lead us towards the experience of peace will give us bliss. Bliss or joy is grossly misunderstood. We equate it with the excitement of a new acquisition. Think of the excitement we have when we acquire something new: like a car or house. How long does it last? Not for long. Once we achieve the goal, the excitement and happiness disappear. This is not the joy or bliss that spiritual masters refer to. Ramana Maharishi, a realised master of the 20th century, defines this condition beautifully. He says: before you get it, even a mustard seed looks like a mountain; after you acquire it even a mountain looks like a mustard seed. Do we know what we want? Unfortunately, none of us do. We think we know. Are we happy with our success? We can’t be. We will never be. Till we know what we want we will never be satisfied with whatever we achieve and acquire. Otherwise at the end we will find that whatever we have acquired is of no value to us. We are chasing desires. This chasing leads us into an endless cycle of desires and wants. Most of these desires are not our own. They are borrowed from others. The possessive feeling and labelling of things and relationships as ‘mine’ is the most dangerous trap that mind can set for us. It is never ending, never fulfilling and always leading to suffering. Why are we so uncomfortable asking ourselves why we seek something? We run without resting in order to fulfil desires based on comparison with what others have. Once we get what we are running for, we do not understand what we have been running for. So, the discontent stays. How can we end this confusion or suffering? We will continue to suffer and be disillusioned until we know who we are, the question of what we want cannot be answered. The smallest but greatest book I have ever read is a book of sayings by Ramana Maharishi titled Who Am I. Let us dare to ask this question. This question will lead us into a long journey. Our question transforms itself into a quest. Our urge becomes urgent. We often think answers will end our questions or problems. Any question that is directional and leads to an answer will only add to our confusion. Only when the question leads us toward experience will we experience bliss. Awaken this intelligence, this bliss, this joy that is undiminished. Watching our mind is one way to awaken it. When worship becomes a chore!